One of my favorite wildflowers in the fields around our cabin is Blue-eyed grass – Sisyrinchium montanum Greene. Blue-eyed grass is not a grass at all, but a member of the iris family. It inhabits moist, open ground, fields and meadows, and blooms in late spring and summer. The plant is low and slender, with a deep blue flower and a bright yellow center, borne at the top of a straight, usually unbranched, stem. The stem is two-edged, flattened on the margins. The flowers are borne in the axil of a sharp, upheld bract called a spathe. In French, the plant is called Bermudienne. Montanum means ‘of the mountains’. Notice a little spider found his way into the photo (about 12 o’clock on a petal). New Brunswick is a beautiful province. We also have a great road system, both for those who want to linger and those who want to get through as fast as possible. This time of year I am amazed at the beauty of our four-lane Trans-Canada highway. I think the roadside has been seeded with a wild-flower mix but many are weedy species common in New Brunswick. Whatever their origins, the results are lovely. Long stretches of highway can be boring-beyond-belief, but, because of these expanses of bloom, I am enjoying our drives along the highway this summer. This time of year, my husband does an inventory of the Pink Lady’s Slippers (Cypripedium acaule) on our property. This year, he found 10. He only saw three last year but there have been as many as 15 in bloom at one time. We never pick them and try to keep our property natural and wooded. The Pink Lady’s Slipper prefers acidic soil and partly shady conditions, making our grey woods an ideal habitat. Our flowers are often a pale pink or white variety. On a drive to Sussex yesterday, we found Trout Lily blooming in many ditches along the back roads. Trout Lily is an herbaceous colonial plant, covering slopes in rich, moist hardwoods. The plant is also known as Dog’s Tooth Violet, Yellow Adder’s-tongue, Fawn-lily, and in French, ail doux. The yellow lily-like flowers bloom in New Brunswick in May. 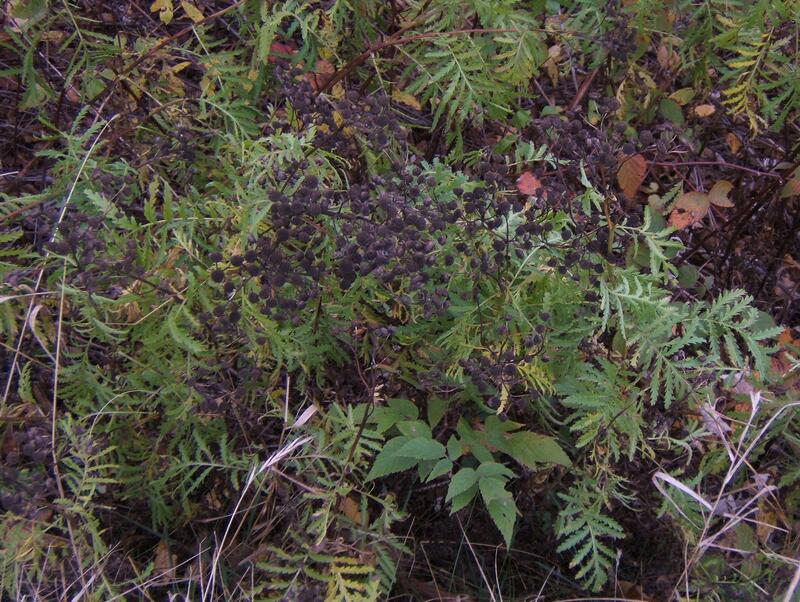 The leaves are mottled in maroon and green. The young leaves and bulb-like ‘corm’ are edible but should only be gathered if the plants are abundant, to conserve the species. So many colours! The orange of the big pumpkin on our doorstep. The reds and yellows of the Red Maple leaves in piles under our feet. The bright white of the moon this month. The golden colour of the needles of the Tamarack now falling with every breath of wind. 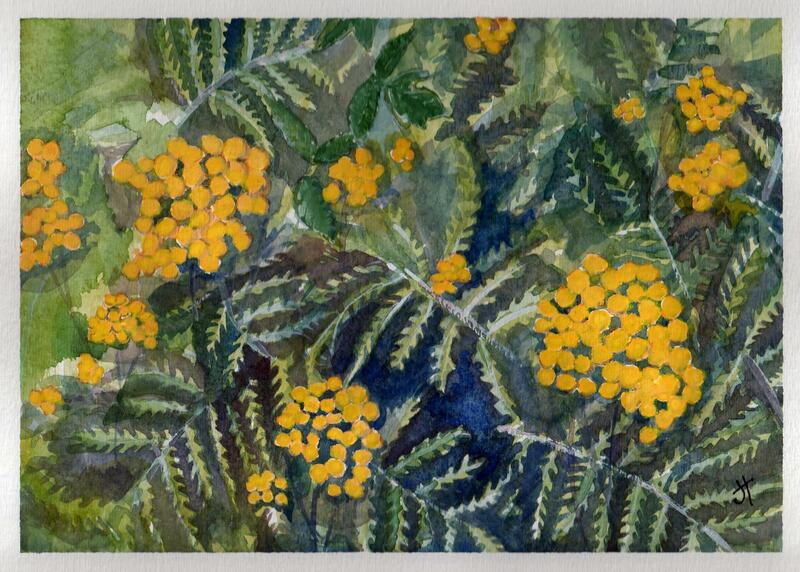 The colour that has inspired me this week is the yellow of Tansy (Tansy vulgare L.) still bright along the road in Fredericton. The flowers are like brilliant yellow buttons. I couldn’t duplicate the colour with the yellows in my watercolour palette, but after layers of alternating yellow and white, I have realised how wonderful the yellows of nature really are! 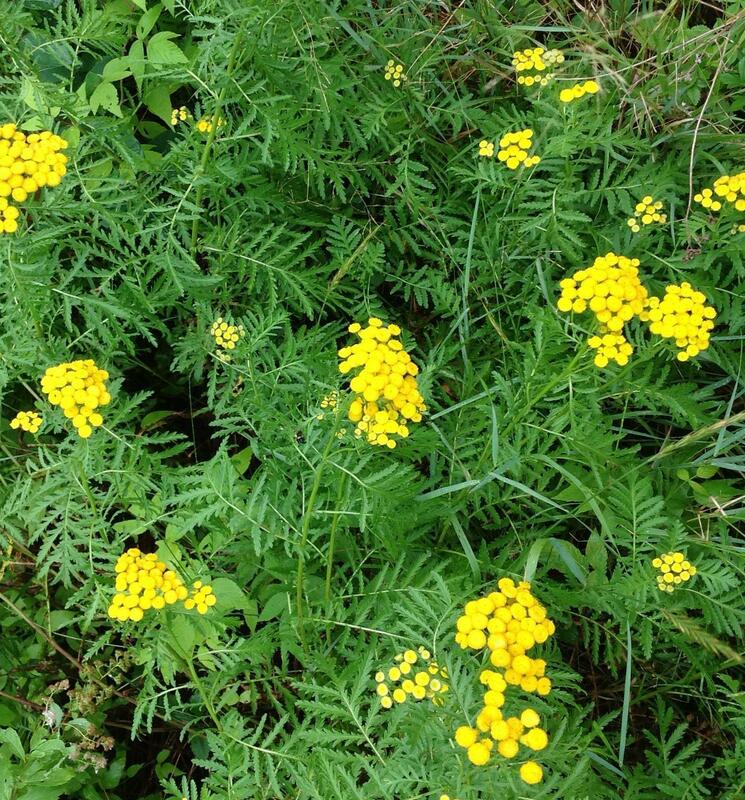 In a month’s time, the bright yellow heads of the Tansy will be black!